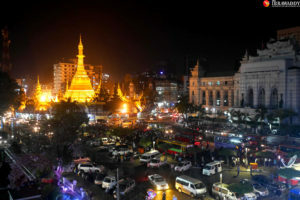 RANGOON —Nearly a full four years after Burma’s military regime ceded power and the nation embarked on a democratic reform process, an initial wave of optimism has slowly faded into a more nuanced reality. The closing year, 2014, could be characterized as one of tough and tedious politics as the country prepares for general elections late next year. But 2014 wasn’t wholly without excitement; it was a year punctuated by surprising political maneuvers and bookended by tragedy. In January, when it seemed that ethno-religious tensions were beginning to calm, news emerged of an alleged massacre in Arakan State. As the year drew to a close, three other remarkable and deadly events took place, casting a somber tone as 2015 approaches. The past year was thematic, if not immediately coherent. 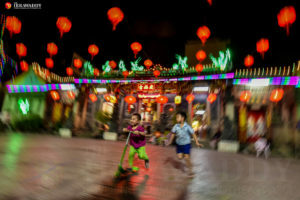 Constitutional reform, tempering extremism, land and education reform, the role of the military in security and politics, and laying the groundwork for democratic elections were recurrent subjects in headlines this year. The Irrawaddy looks back on key events that will perhaps be better understood in retrospect. January On Jan. 1, Burma assumed its first chairmanship of the Association of Southeast Asian Nations (Asean). As is customary when marking key occasions, and in honor of the 66th anniversary of Burma’s independence, President Thein Sein granted amnesty to hundreds of prisoners. While the move made international headlines and was generally welcomed, critics were quick to point out that Thein Sein had missed the mark on his promise to clear Burma’s jails of political prisoners by the end of 2013. At the time of the pardon, the semi-governmental Political Prisoners Scrutinizing Committee said that scores of political prisoners remained in jail, and that more were being unfairly imprisoned on charges of unlawful assembly and incitement. [irrawaddy_gallery] Late in the month, reports began to surface that dozens of Rohingya Muslims had been killed by a Buddhist mob in northern Arakan State after a policeman patrolling Du Char Yar Tan village went missing. The government denied the alleged massacre despite credible evidence gathered by the United Nations. February Five employees of the Unity weekly journal were arrested for violating Burma’s colonial-era Official Secrets Act after publishing an investigative report about an alleged chemical weapons factory in Pauk Township of Magwe Division. 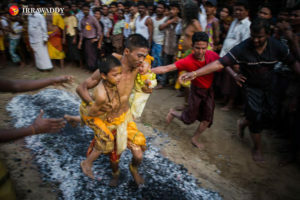 A parliamentary committee tasked with reviewing Burma’s military-drafted 2008 Constitution published findings recommending that lawmakers uphold two controversial clauses: one prohibiting opposition leader Aung San Suu Kyi from becoming president and another guaranteeing military veto power over further amendments. 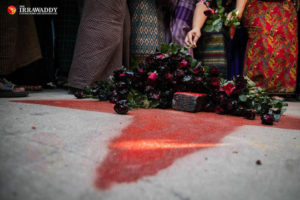 In late February, tensions remained high in Arakan State after the Myanmar National Human Rights Commission concluded that the alleged massacre in Du Char Yar Tan could not be verified. The government suspended all operations of frontline health providers Médicine Sans Frontières (MSF) following disagreements over aid programs in Arakan State, where the group offered vital medical aid to Rohingya Muslims. The group was later allowed to resume work in some parts of the country. Thein Sein requested that Parliament consider a proposal to draft a legislative package now known as the “Protection of Race and Religion Bills,” proposed by the nationalist group Ma Ba Tha that aims to preserve Burma’s Buddhist identity by restricting interfaith marriage, religious conversion and other aspects of family life. March Thein Sein received Aung San Suu Kyi at his farm residence in Naypyidaw on March 9, the fourth face-to-face talks between the two since their initial meeting in 2011. In mid-March, the president signed two landmark press bills into law: the Media Law, drafted by industry professionals, and the government-drafted Printers and Publishers Registration Law. Days later, he joined Commander-in-Chief Snr-Gen Min Aung Hlaing on an unprecedented visit to Kachin State, where government troops have been fighting with ethnic rebels since mid-2011. On March 26 and 27, mob violence again gripped Burma’s western coast, when angry Buddhists ransacked the homes and offices of international aid workers in the Arakan State capital Sittwe. A 13-year-old Arakanese girl was killed by a stray bullet as police fired warning shots to disperse the crowd. In the wake of protests by Buddhist nationalists and amid fear that it risked inciting violence and under-representing several minorities, Burma began the rollout of its first national census in more than 30 years on March 30. April A nationwide ban on raw timber exports went into effect on April 1, in an attempt to rein in illicit cross-border trade to China and promote value-adding domestic processing industries. On April 7, a video journalist for the Democratic Voice of Burma (DVB), Zaw Pe, was sentenced to one year in prison on charges of trespassing and disrupting a civil servant while conducting an interview for an investigative report about corruption. He was later released after serving three months in jail. Amid the chaos of a tumultuous first quarter, Suu Kyi made a visit to Europe, where she shored up international support for constitutional reform. Shortly after her return, Burma lost one of its most highly regarded intellectual figures. Win Tin, a revered journalist and co-founder of the National League for Democracy (NLD), passed away in Rangoon on April 21 at the age of 84. 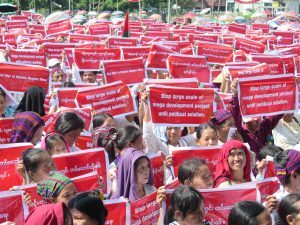 May In response to the incarceration of Zaw Pe and the detention of five Unity journal staffers, demonstrators took to the streets in Magwe Division to demand press freedom and protection for journalists. In an ironic twist, DVB reporter Angus Watson, an Australian national, was swiftly deported after covering the demonstration. South Korean Yanghee Lee was appointed as the UN special rapporteur on human rights in Burma, succeeding Tomás Ojea Quintana after his six-year term. June Hsan Hsint was dismissed as Burma’s minister of religious affairs in an unexpected political shuffle on June 19. He was later sentenced to 13 years in years in prison on charges of graft and sedition. The ancient city-states of Pyu became Burma’s first entry into the Unesco World Heritage List. The trio of cities—Halin, Beikthano and Sri Ksetra—are located in central Burma and feature the walled remains of sites built by the now-extinct Pyu people from the first to ninth centuries AD. Late in the month, amendments were made to Burma’s controversial Peaceful Assembly Law that cut punishments down to six months for participating in unpermitted demonstrations. July After the relative calm of previous months, inter-communal violence struck Burma’s second largest city, Mandalay, amid rumors that a Buddhist woman was raped by a Muslim tea shop owner. Two nights of violence resulted in the deaths of two men—one Buddhist and one Muslim. Burma watchers were shocked again only about a week later, when Unity journal’s CEO and four reporters were sentenced to 10 years in prison with hard labor. Their sentences were later reduced to seven years. Ye Htut, who throughout the saga served as a presidential spokesperson, was nominated as Burma’s new information minister on July 30. His promotion came amid mounting criticism of the government’s treatment of the fourth estate. Communications improved, however, as Qatar-based Ooredoo began rolling out its nationwide telecoms network by launching cut-rate SIM cards in Mandalay. August On Aug. 9, a team of divers began the long and ultimately fruitless search for Burma’s legendary Dhammazedi bell, which is believed to have been on the floor of the Rangoon River for more than 400 years. Whereabouts of the relic are still unknown despite the US$250,000 effort. 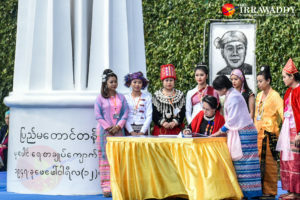 After spending months courting domestic and international support for constitutional amendments, the NLD and the 88 Generation Peace and Open Society presented Parliament with a pro-reform petition signed by nearly 5 million people. Burma’s news cycle took a turn for the absurd on Aug. 29, when a South Korean beauty pageant organizer of dubious pedigree dethroned this year’s Burmese winner, May Myat Noe, accusing her of being rude and dishonest, and of running off with the tiara. In the transnational tiff that followed, May Myat Noe said she would not return the crown until the Miss Asia Pacific World pageant apologized for the defamation, as allegations emerged that she was underage and coaxed into getting breast augmentation by the competition’s organizers. Preliminary results of Burma’s national census, published on Aug. 30, revealed that Burma had a population of 51.4 million people, nearly 9 million less than a widely cited previous estimate of 60 million. Complete results of the census are expected to be published in May 2015. September Burma’s Union Election Commission made an unexpected announcement that parliamentary by-elections slated for late 2014 would be cancelled, explaining that the polls could divert energy and resources from general elections to be held in 2015. Rangoon’s Chief Minister Myint Swe revealed a divisive plan to expand the nation’s commercial capital. A wave of criticism later foiled the expansion, as emerging details of the plan pointed to corruption. October October began with transnational intrigue when two Burmese migrant workers were arrested as suspects in a high-profile double murder in southern Thailand, where a pair of British tourists were found dead in mid-September. But it also began with big business news as the Central Bank of Myanmar announced that nine foreign banks—including the world’s largest, Beijing-based Industrial & Commercial Bank of China—were awarded long-awaited licenses to operate with limited services in Burma. The month closed with another major business story as Norwegian telecoms operator Telenor launched its initial services. 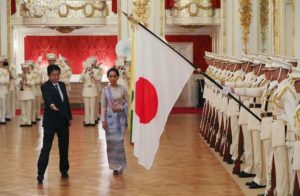 October was also an eventful month in politics, as Burma scrambled to prepare for the forthcoming Asean Summit. The government announced that general elections would be held in either late October or early November of 2015. On Oct. 31, Thein Sein, leaders of the military and parliamentary speakers held an unprecedented meeting with Suu Kyi and a few other political leaders, but the meeting failed to achieve a major breakthrough. That same day, ruling party parliamentarian and former minister Aung Thaung was added to the US Specially Designated Nationals list for undermining reform and “perpetuating violence” amid speculation that he helped fund an anti-Muslim nationalist movement. Perhaps the defining moment of the month, however, was Oct. 23, when the Burma Army informed members of the Interim Press Council that a missing journalist was shot dead while in military custody. 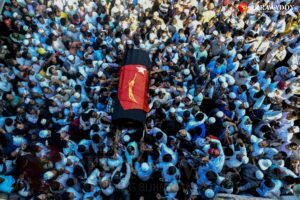 The memo portrayed freelance reporter Aung Kyaw Naing, also known as Par Gyi, as a member of a rebel armed group, and claimed that he was shot dead while attempting to seize a weapon and flee. A subsequent investigation by the National Human Rights Commission failed to satisfy his widow and other observers who maintain that he was tortured. November In the lead-up to the 25th Asean Summit, Suu Kyi told reporters that democratic reforms had “stalled” since early 2013. The Nobel laureate and political darling urged the US government to “seriously think” about the country’s stagnating reforms. US President Barack Obama made his second visit to Burma as head of state during the summit, which was held from Nov. 11-13 in Naypyidaw. The summit and other related conferences drew leaders from around the globe, but the event was largely closed off to observers. Not a week after world leaders packed up and left Burma, another military scandal ensued. Twenty-three cadets from several ethnic armed groups were killed on Nov. 19 when the Burma Army launched multiple rounds of artillery onto a rebel military academy near the headquarters of the Kachin Independence Army in Laiza, Kachin State. The military said the deaths were “unintentional,” and that the weapons were launched as a warning after skirmishes in the southern part of the state, an explanation that peace negotiators found lacking. December State media announced that the controversial “Protection of Race and Religion Bills” had been submitted for parliamentary debate. While the legislation had been tempered by a parliamentary drafting committee, the current drafts uphold some restrictions on interfaith marriage, religious conversion, monogamy and population control. In mid-December, nationalist Buddhist sentiment surfaced once again when a New Zealand national and two of his local business partners were arrested for insulting religion after marketing an event with an image of the Buddha wearing headphones. 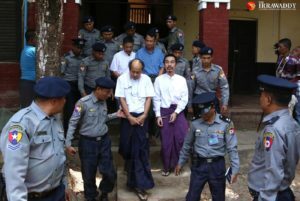 The trio is still being held in Rangoon’s notorious Insein prison and could face up to four years in jail. 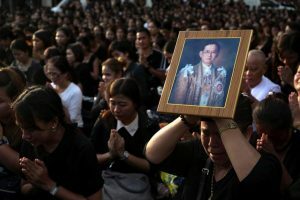 The saddening news that a villager had been fatally shot by police while protesting an alleged land grab shocked the nation on Dec. 22. KhinWin, 56, died on the spot when she was shot in the forehead near the site of the Letpadaung copper mining project in Sagaing Division. 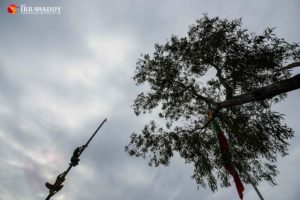 The following day in Rangoon, the year’s last round of peace negotiations ended without closure as government and ethnic leaders failed to meet an end-of-year goal of signing a nationwide ceasefire agreement. 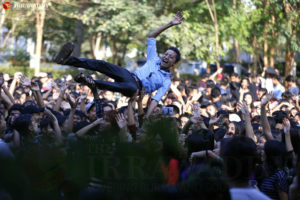 On Dec. 27, municipal elections were held in Rangoon. A 26 percent turnout—representing about 2 percent of the city’s population—elected 115 representatives in the city’s first polls in more than 60 years, though candidates and voters expressed concern that the elections were neither free nor fair. Research compiled by Wei Yan Aung, Thet Ko Ko and Feliz Solomon.